I'm an Officer in The Salvation Army, currently appointed with my wife as Corps Officers at the Rochester Corps in country Victoria (20 minutes out of Echuca). I play violin and guitar, amongst many others, and love golf and running. Wow, I’ve finally updated this site. A brand new design, and a new format. Figured it was time for a change. I used to host this site off my own server, but it got to be too much of a hassel, so I decided to move it onto a different server – this means that it will be available more often. Just don’t suddenly make it incredibly popular, as I’ve got limited bandwidth. Unfortunately, in the process of moving, I’ve lost all of my posts that had been made. I’ve still got them on my home server, but it doesn’t look like I’ll be getting them moved across easily. I’ll go through them and find any posts that are worth saving and put them back up, but more than likely a lot will get lost (probably for the better). Well, today I climbed, after a descent to the “beach” of large rocks at the wind farm. 507 steps, and quite steep as well. A nice bit of exercise for me. Continued reading Eger’s book. Brought up some more interesting points – one of which I am a fan – the need to consider the audience. He brings up examples starting with Schoenberg, and moving through to Yoko Ono, of how classical music in the second half of the twentieth century scared audiences away and kept them away. It turned classical music into an elitist genre – only if you can understand this will you enjoy it. I have studied Schoenberg’s music, and many other modern pieces. As a “musicologist” I can understand this music. I can appreciate the methodology behind it, and the meaning and reasons for it. However, as a listener, I would not choose to listen to it. If there was a choice between a concert of Beethoven or Schoenberg, I know which I would choose. As a composer, I also understand the necessity to shape my compositions. if I make my music too pleasant to the ear, critics will claim that it’s commercial rubbish – catering for the masses, yet if I make it too complex, there will be no audience, and who really wants to play to a full house of critics? I think some time studying the scores of John Williams might prove fruitful. While I know he has stolen classical themes in the past, I am also aware that he writes great music for films, which are often quite atonal, yet also pleasing to the ear. In an unrelated note, it has come up a couple of times today – business. Eger, early on in his career, wasn’t much of a businessman and missed out on cashing in on a lucrative project that he was involved in. Beethoven despised the business side of music, and a friend encouraged me to consider all sides of music, and stressed not neglecting the business side of my studies. I am planning on taking the second semester of 2008 off from uni, so I might look into taking a business skills course at TAFE or somewhere. While I was down in Albany, I did a lot of reading, and a bit of journaling. One of the books I read was “Einstein’s Violin” by Joseph Eger. It was a really interesting book, combining both his musical memories, but also his interest in Physics, detailing his theory that the Universe is made of Music. While I was reading this book, my journal entries contained my thoughts about issues he raised, and I’d like to share them with you. Once again, holidays. So fantastic. An early morning walk became some unexpected “rock climbing” – literally climbing on large rocks. I started a 500-piece puzzle, and we went wine tasting, bringing back 17 bottles of the Porongorups finest. Uncertain as to how many of these will make it home. I also started reading Joseph Eger’s book “Einstein’s Violin” – which are his notes on Music, Physics and Social Change. I’m still quite early in the book, but a couple of points have got me thinking. In Chapter 6, he starts talking about “What is Music?” – an age old question that barely fits in a book, let alone a chapter (or a journal entry for that matter). After a couple of sections looking at the origins of music, he starts to look at what music is used for and has been used for. He calls up a few stories from different cultures where music has been used to heal – David and Saul from the Hebrew tradition, music being used to treat outbursts of the mentally ill and so-on. He then turns to China, where the ancient Chinese “believed that music was the basis of everything.” The Chinese philosopher Confucius said that if the music changed, then society would accordingly change. Confucius attached the same importance to music as nations attach to military and economic issues today. Eger relates a storey of Emperor Shun, who would travel through his kingdom once a year to ensure all was in order. He did not check health, or diplomatic issues, but the five notes of the scale to ensure they were in perfect correspondence with those then in use. Eger goes on to say that society reflected the music – if the music was wistful or romantic, the people would be wistful or romantic. If the music was strong or military then the people would be militaristic. Stable musical style promoted a stable society, but a changing style saw change in peoples lives. I can think of a couple of examples of this in modern times where society seems to follow music. In the early twentieth century, music saw incredible change. Thanks to technology, people were able to hear music from all over the world. This inspired “Western” composers and brought about massive musical change – from the French Impressionists such as Debussy and ravel to the Serialist composers of Schoenberg and Webern. As a result of these massive changes in music, society also experienced massive change. Two world wars within thirty years, with the results of those wars still being felt today (The division of land in the Middle East, for example). In the 1960’s and 1970’s, the Korean and Vietnamese Wars occurred <>. While this is an area of history that I’m not too familiar with, I doubt anyone would be able to dismiss the importance of the protest songs by artists such as Bob Dylan and John Lennon, in changing public opinion of their governments action. Was it then any surprise that musicians have been some of the most vocal opponents against the war in Iraq, and also the most vocal encourager’s of getting people to vote – both in Australia and the USA? When I started thinking about this, I started wondering if this was limited to folk music, or whether classical music was a part of this as well. In history classes, we are often taught the opposite – that music follows – it follows literature, follows art, follows society. There are obviously reasons for this, but I think investigation into the opposite is warranted. I also got thinking about what is “classical” music. The more I think about it, the less I can distinguish between Pop/Commercial and Classical. Should I therefore refer to myself not as a classical musician, but as a musician? Ben: I’d love to hear your thoughts about this, please comment! I’ll post more tomorrow. I’m in the middle of reading Violin Dreams by Arnold Steinhardt, the First violinist with the Guarneri String Quartet. It’s a really interesting book, and is looking like a great source of inspiration for me. But there are some really great quotes in here that I want to share. In the hand of a skillful player, the violin represents the sweetness of the lute, the suavity of the viol, the majesty of the harp, the force of the trumpet, the vivacity of the fife, the sadness of the flute, the pathetic quality of the cornet; as if every variety, as in the great edifice of the organ, is heard with marvelous artifice. I lived in the woods, until I was slain by the relentless axe. Whilst I was alive I was silent, but in death my melody is exquisite. Myra Jagendorf, in a school yearbook message to Arnold Steinhardt. In a way, it will be your duty to mankind to contribute your music to as many people as possible and to enrich their lives as well as your own. I really like that last one, I think it sums up a lot of my goals. Music is something that is to be shared, what we do is deep and often rather odd to many people. It is our goal to invite them into our world and share our life and our music with them. It is the arts that will save humanity and keep it going. From the Avanoo founders, and thanks to StumbleUpon, I discovered How to Walk Through Steel-Reinforced Walls. While sitting in a coffee shop, this guy decided that instead of teaching a little boy who was trying to walk through walls like Harry Potter that it couldn’t be done, he thought to foster his imagination. He took him through the steps listed, as instructions on how to walk through walls – without actually telling him that it could or couldn’t be done. As fantastic a story as it is, obviously some people just don’t get it – including the mother of the little child, who said that his advice was very irresponsible and that he shouldn’t have kids for a very long time. Henry Fogel recently wrote a piece exploring whether denying people the opportunity to applaud between movements of a piece was causing people to be scared of attending a classical music concert. He quotes various sources from the past pointing out examples of where the audience have applauded during the work, and makes it seem natural. Now, I am a “traditionalist” – though Mr Fogel would have me believe otherwise – because I do not want to applaud after movements – only after the work. There are a number of reasons that I do this. First of all, I have been a performer. I know the concentration that is required for an entire work. Just because you’ve completed one movement, doesn’t mean that you can let down your guard. If someone chooses to clap, and the whole audience then joins in, your concentration is broken, and it can take a little while for you to get back into it. Second – despite what Mr Fogel says – I believe that works are intended to be conceived as a whole. Even a work such as Scheherazade, which Mr Fogel claims to be four separate tone poems, is in itself one tone poem that is split up into four different sections. But there is a common story line that runs through the whole work. Disrupting this through applause is like standing up and cheering during an ad break on the telly. There’s still more to go, and it’s just going to get better. In Scheherazade, the whole work is building up towards the last movement. And it’s not just tone poems either. Concerti are the ones most often interrupted by Applause, generally after the first movement, which more than likely has the most fantastic cadenza that even I want to applaud their work. However, any multi-movement work – including concerti – must be conceived in a wholistic manner. If you separate each movement then the connection is lost. There is then no reason for the second movement to be slower. There is then no reason for the works to be in related keys. Now, I don’t scorn the people who do applaud – and perhaps that is the real change that needs to be made. Ensure that we as musicians do not scorn those that want to applaud, but in a like manner – allow those who wish to remain silent and take in the work as a whole to do so. 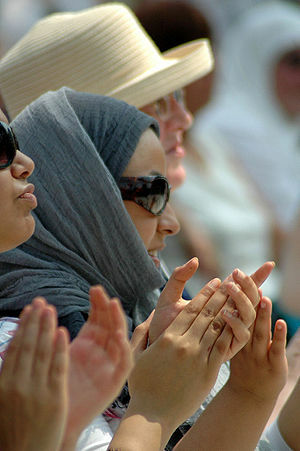 The change is then not so much of a forced one – one of encouraging people to applaud, thus taking away from those who wish to take in as a whole – but is a welcoming one that welcomes people into classical music, no matter whether they want to applaud at every movements end, or whether they – like myself – wish to take in the work as a whole.